Saturday dawned wet and overcast with several coffees consumed before anyone summoned the enthusiasm to move. 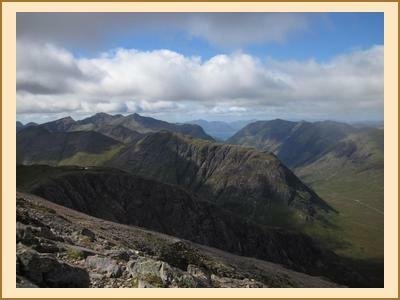 Penny did the Ballachulish horseshoe. Fiona M, Fiona R and Mike tagging Colditz Corbett with no views to speak of and much complaining about the slithery terrain underfoot - naturally the improved on the descent! Alison W, Ian, Gillian and Fiona C climbed Beinn Trilleachan on Saturday, with reasonable views and managed to dodge most of the rain. Ron and Ben did Curved Ridge which proved to be an expensive day out for Ron as he managed to leave his favourite Montane top plus various other bits of kit inside the bag he'd been sitting on! He'd thought his bag was feeling light on the descent but didn't realise why until back at the hut. After walking various folks headed over to the Ice Factor where Mike deposited himself in the bar and the 2 Fiona's + Alison C went indoor climbing. They all watched the end of The Great Climb on the big screen in the Ice Factor bar where Tim Emmett completed the climb in truly horrific conditions. Wet schist and e5ish climbing, absolutely gripping to watch. On Sunday the weather started even worse, blowing a hoolie and rain bouncing off the roof/windows. However after breakfast it was starting to clear up so various folks headed off for the hills. Gillian, Alison W & Ian did some monster Graham / Corbett fest at the back of the Ballachulish horseshoe which included Fraochaidh. 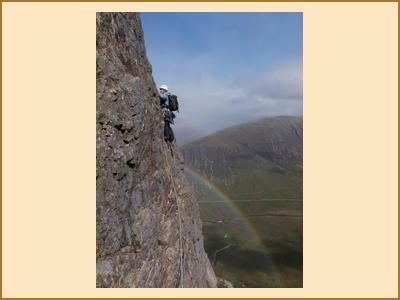 Fiona C scrambled up the zig-zags onto Gear Aonach before traversing along and down into the head of the lost valley. Fiona R and Mike headed for Rannoch Wall. Fully expecting to end up taking a rack for a walk, however, they were pleasantly surprised to discover that January Jigsaw was both dry and quiet so they headed up that, albeit in full waterproofs just case the weather returned. Anne C, Kenny and Alison C went up Curved Ridge in search of Ron's missing belongings. Ron meanwhile was accosting anyone walking past Lagangarbh asking them to look for his bag of stuff. Given the overnight winds the bag was most likely half way across Rannoch Moor! For those lucky enough to be staying up north beyond the weekend (Alison, Ian, Gillian and Fiona C) it was the start of a fantastic week of weather in the west.